This is a method – I repeat, this is a method – designed to use whatever you have on hand – in combination with the same ‘ole, same ‘ole, to create a brand new meal. Switch it up, combine things differently – you, your family and your friends will be amazed how a little imagination can transform the same ‘ole, same ‘ole, into the brand new, brand new! The contents of your wrap are as endless as a lot of things – so in an attempt to keep it light on the never-ending front – we all know about good & evil, love & hate, fraud & corruption, birth, death, taxes, disease, disaster & destruction – so how about dust, dishes & dirt – now that’s a never-ending story if I ever heard one! 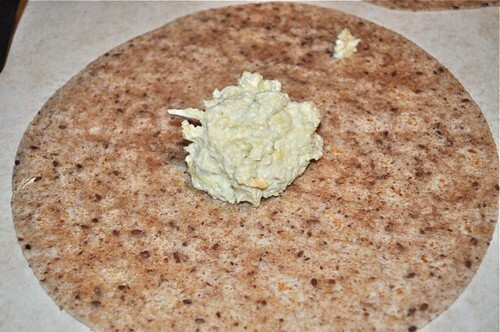 The secret to pulling this off at a moment’s notice is to never, ever, ever, be caught without tortillas, (the whole-grainier the better) and you will be in a position to wrap whenever the urge strikes – Jay-Z beware, forget about empire, how about inspire state of mind! 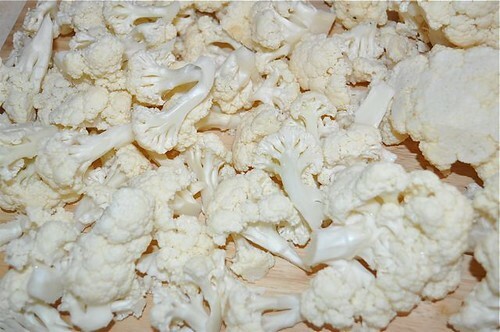 As it happens regularly in my kitchen, I’m once again staring at the makings of a meal – a protein – in this case, a pork loin, a few vegetables – in this case, a head of cauliflower, an onion, a bit of garlic (! 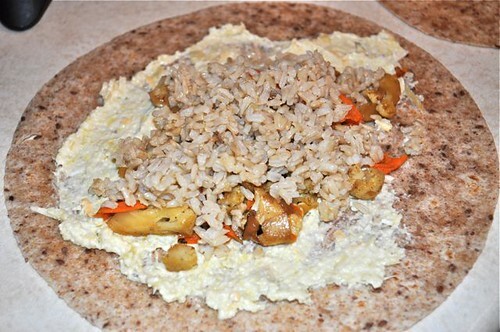 ), a couple of carrots and a carb – in this case, brown rice and a few tortillas. The question becomes, now what? Well, read on to see how a little pork loin, a couple of vegetables and rice come together like they’ve never come together before. It’s a new day – and this method, by the way, can bring anything together, kinda like community farms, church & velcro! Happy wrapping! 1. 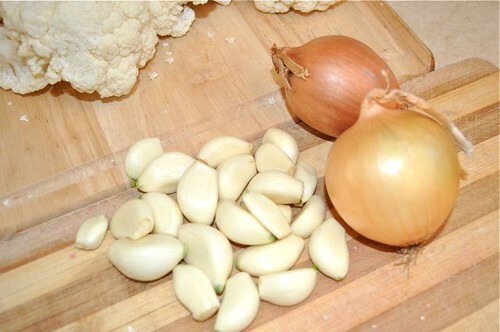 Start with onions, garlic & cauliflower. 2. 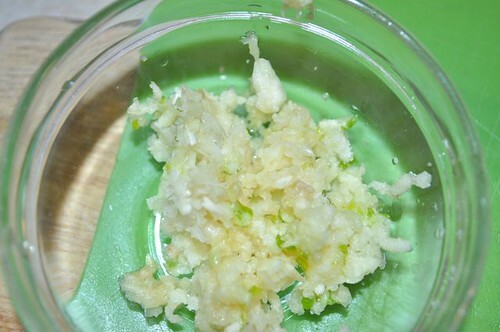 Mince the garlic, not all of it – 3-4 cloves will do – the rest is headed elsewhere! 4. 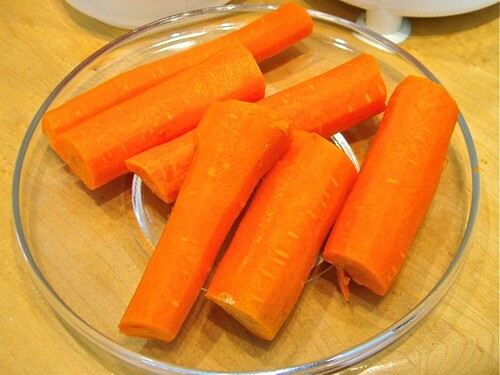 Peel & half the carrots. 5. 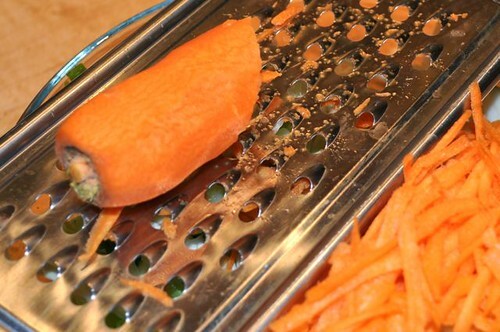 Grate the carrots – they cook much more quickly. 6. Stir-fry all the vegetables until softish. 7. 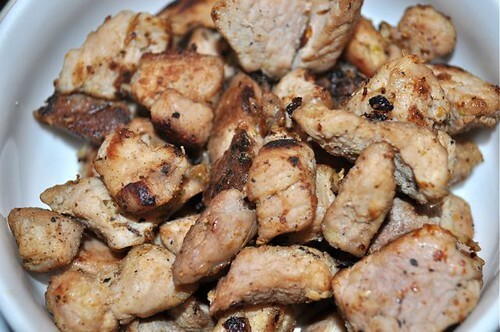 I’m using pork loin – I diced it up. Like the veggies, you could use chicken, beef, fish, shrimp – just dice it up. 8. 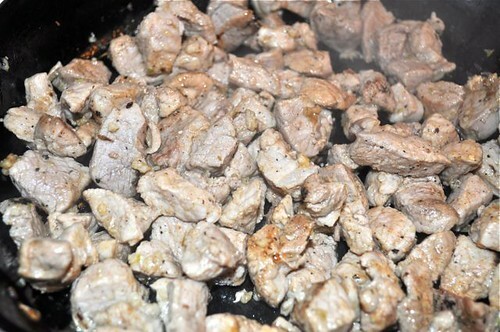 Get it cooking in a hot pan. 9. Keep going until it’s seared and caramelized. 10. Just like this – brown bits mean big flavour! 12. Grab the tortillas and get ready to assemble. You’ll need something spreadable which acts as the “glue”. Open your fridge – it could be cream cheese, any dip, creamy salad dressing, roasted tomato, corn & black bean salsa, pasta or pesto sauce, plain yogurt, light sour cream or ricotta, refried beans, split-pea lentil dip, roasted red pepper purée or hummus – I had a little leftover artichoke dip. 13. 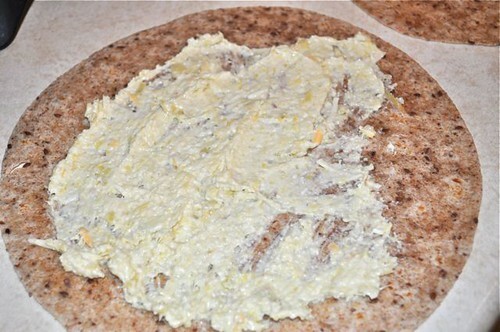 Spread it to cover the tortilla. 14. 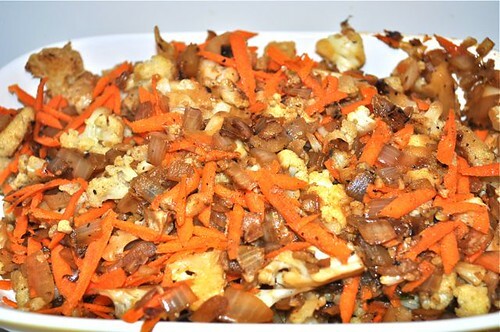 Lay on a little of the vegetable mixture. 15. 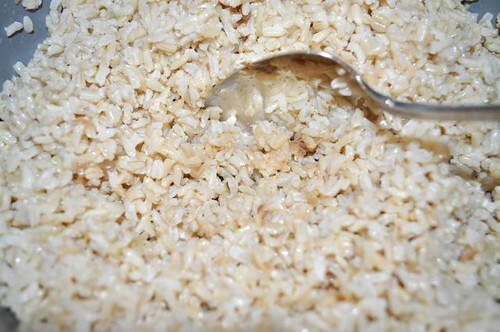 Top with a little rice. 16. 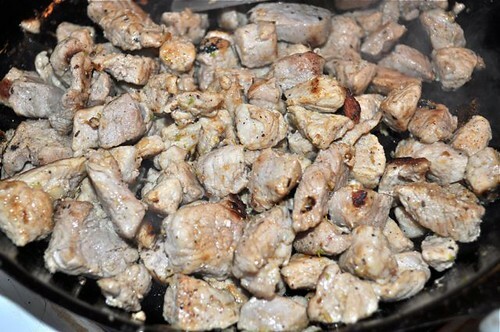 Add a little pork. 17. 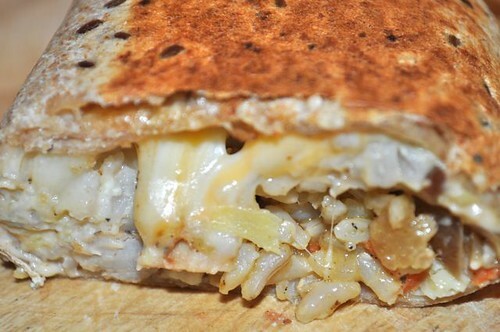 A little grated cheese brings it all together. 18. 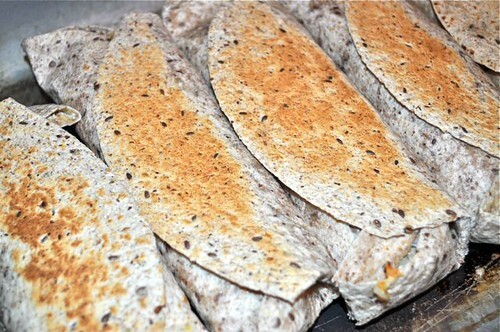 Roll it up burrito-style and repeat – fold the bottom of the tortilla over the filling, keep it snug, bring in both edges and keep rolling. 19. Fire up a pan to medium-high heat, and brown the tortillas on all sides – no oil required. 20. Flip and brown again. 21. 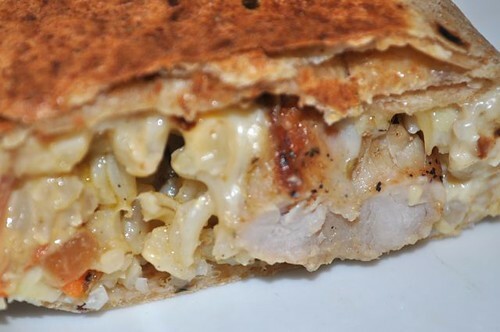 Now that’s what I’m talkin’ about – the outside is crispy, the inside is oozy, you’re impressed & your family is woozy! 22. Who could resist this? I serve it with a little spiced up plain yogurt or light sour cream. A dip always takes it over the top – deelish! Make as many as you want – count on one tortilla per person. This is a method – 10 steps to heaven! In the rare event you have no leftovers – start making some fillers. 1. Start with diced onion, minced garlic and whatever vegetables you like, cut to the same size and stir-fried around in a hot pan with a little olive oil. 2. 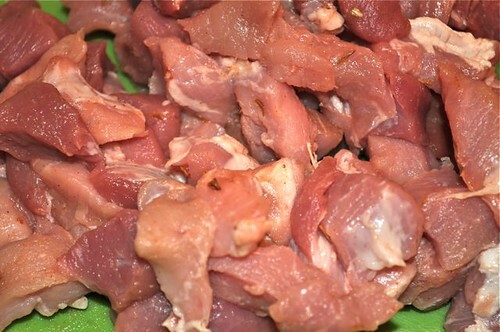 Do the same with a ground/diced up protein (or not) – chicken, beef, pork, fish or tofu. 3. Make some rice or boil up a little pasta or potatoes. 4. 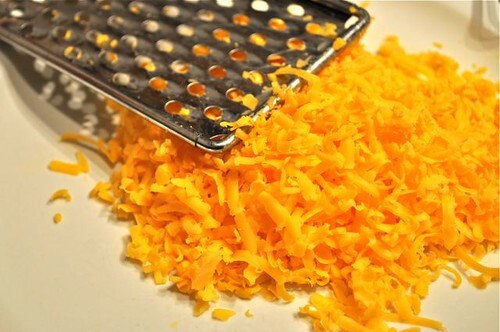 Grate a little cheese. 5. Lay a tortilla on your board. 6. You’ll need something spreadable which acts as the “glue” – it could be cream cheese, any dip, creamy salad dressing, roasted tomato, corn & black bean salsa, pasta or pesto sauce, plain yogurt, light sour cream or ricotta, refried beans, split-pea lentil dip, roasted red pepper purée or hummus – I had a little leftover artichoke dip. 7. 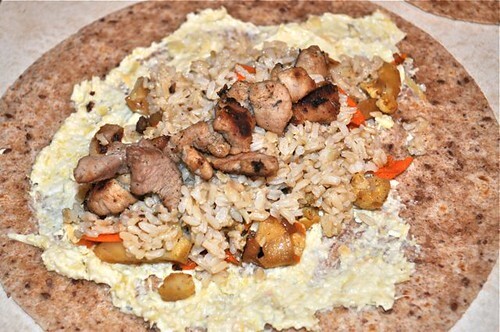 After the spread, start assembling, and the order is irrelevant – veggies, rice, pork, cheese – just get it all down. You could also put all the elements in a bowl and mix them together before assembling. 8. 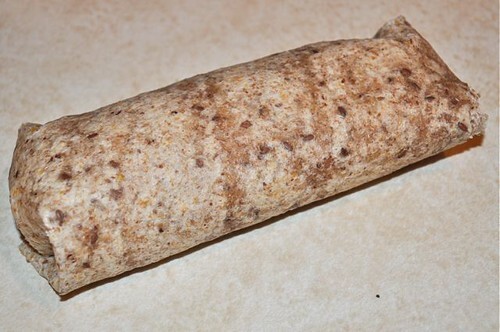 Roll it up burrito-style – fold the bottom of the tortilla over the filling, keep it snug, bring in both edges and keep rolling. 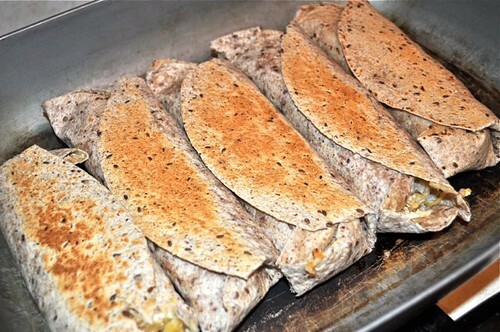 Repeat with as many tortillas as you want to make or you run out of fillings – whichever comes first. 9. Heat up a dry pan, start with seam-side down and continue to brown on all sides until the outside is crispy & the inside is oozy. 10. 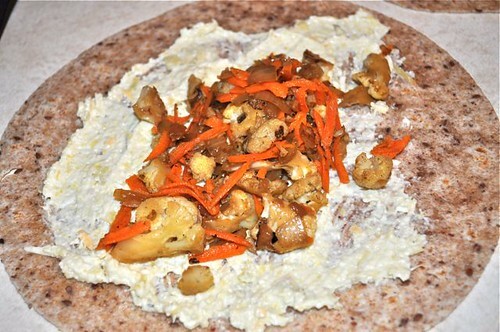 Get a dip together – start with plain yogurt & hot sauce – cut the wrap in half and dig in. flavourful dips & sauces – start with yogurt or light sour cream – try a creamy vinaigrette, peanut sauce or asian-style dipping sauce – chop a little something fresh in at the end like parsley, cilantro or scallions – and always pack some heat!